This is a port to SSE from the original mod here: http://www.nexusmods.com/skyrim/mods/14194/? This was one of my favorite mods in Skyrim, a very nicely done set of magic-themed armor. Please note that on the original mod page here, permissions specify that reuploading is allowed as long as credit is given to the original authors. Note that none of the assets used here are mine, and ALL CREDIT goes to Syndharos, for his work with concepts, art direction, screenshots and installer images, and also to Null9, for his awesome work with modeling and textures. Don't forget to show your appreciation and going to their page to endorse! To clarify still, both original authors have long since become inactive. Once again to specify, NONE OF THIS WORK IS MINE. This is merely a port. This mod adds up to three new male only cleric armor variants to the game of different armor ratings. This allows the player to keep a clothing, light, and heavy variant installed simultaneously without having to uninstall and reinstall the mod from NMM to switch. Each armor type variant allows the user to select unique rune colors and skin replacer options. This mod doesn't require the original Male Cleric Armor mod to function; but installing the original mod can allow you up to four simultaneously installed variants. Armor type determines both the weight and stats of the armor in-game. Light and cloth choices can be crafted under the leather crafting perk, while heavy armor is crafted under the ebony category. In all cases we have taken care to ensure the stats are reasonable and balanced. Heavy armor closely follows the base ebony stats, while light armor is very close to dragon plate stats. 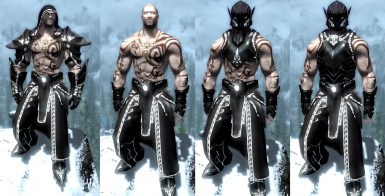 The crafting recipes are variations of the basic Ebony armor recipes adjusted for the type of armor in question; but there are some important differences that will make acquiring the required ingredients a slight challenge. The crafting recipes can be located under either leather or ebony depending on the choice of armor rating. For light and cloth variants the crafting recipes are located under the leather category. The heavy armor variants have the crafting recipes located under the ebony category. More information can be found at the original mod page. It is highly recommended you use NMM to install this mod.